CardMonkey's Paper Jungle: When was the last time you went on a Picnik? ... not the kind where you spread your checkered blanket under a tree, and Yogi Bear descends to steal your "Pic-nic basket, Boo-Boo." 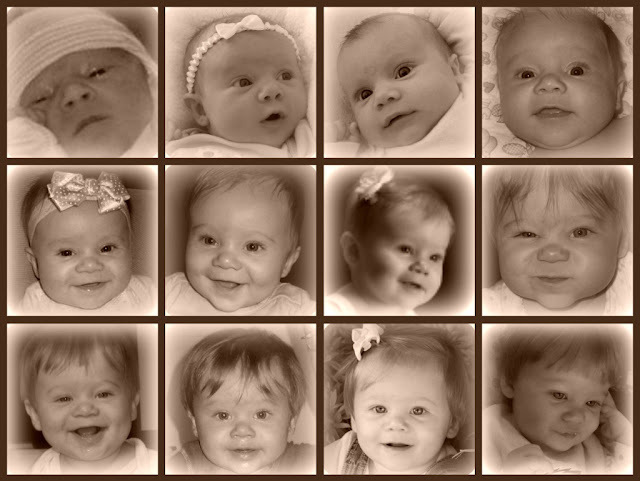 Check out this Picnik Collage I made of grandbaby Charlotte through the year -- beginning (top left) with birth, then at One Month, Month Two, etc. Picnik made it so easy to convert each of these pics to B&W, soften the sides, use rounded corners, etc. Try it, you'll LOVE it! So, so, so precious! I just wanna kiss her lil cheeks!! She is so stinking adorable. I love it when you post her cutie pie pictures. She'll be all grown-up TOO fast. I love Picnik--one of my favorite photo editting sites ever! Your collage is beautiful--I made a similiar one of my niece through her 2 years!